Carlee Oakley was recognized for her research project. 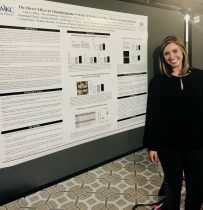 UMKC medical student Carlee Oakley is one of only five students nationwide to win a TL1 Top Poster Award for her research. It was presented recently in Washington at a meeting of the Association for Clinical and Translational Science. Patients with chronic kidney disease have an increased risk for heart disease and heart attacks, and Oakley’s research identified a possible factor in that risk. She found that the chemical TMAO, trimethylamine-N-oxide, found in higher concentrations in kidney patients, increases the force and rate of cardiac contractions. The Association for Clinical and Translational Science awarded blue ribbons to 60 research projects, and 57 of them were presented and judged at the conference. Oakley and four others were judged the best and received blue ribbon awards, significant of being in the top 10 percent of entrants. The contest is part of the Frontiers CTSA TL1 program, a research fellowship. CTSA stands for clinical and translational science awards. Oakley took a year off between her fifth and sixth years of UMKC’s B.A./M.D. program for the fellowship. 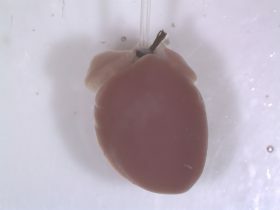 Her initial research used a mouse heart. Oakley also recently defended her TL1 thesis, completing her fellowship work with honors. She did substantial work on her research with Wacker and other members of his lab team before going into the fellowship. She said David Sanborn, who is set to graduate and start a residency at the Mayo Clinic this summer, helped her with the project along with other members of the Wacker lab. She also collaborated with Dr. Jason Stubbs, a nephrologist and researcher at the University of Kansas Medical Center’s Kidney Institute, and a team of cardiac surgeons at the KU Medical Center’s Cardiovascular Research Institute. Oakley, who plans a career in neurology, said she was drawn to UMKC from Sioux City, Iowa, because she was impressed by the School of Medicine’s six-year program and docent system. She met Wacker during the Human Structure Function course he helps teach and joined his cardiovascular research lab shortly after. The other top finishers receiving the poster award are from the University of Michigan, Duke University, the University of Colorado-Denver and Georgetown-Howard Universities.